Congratulations to "Cathy P" the winner of Debra's giveaway! Thank you to all who participated. Former Special Agent Jess Harris is learning just how difficult a career change can be. If you read the first two books in the Faces of Evil series you know that things ended on a bit of an unpleasant note for her at Quantico. After seventeen years of dedicated service having one failed case seemingly destroy all she had worked to accomplish was not only unexpected but shattering. In the midst of this turmoil a man she hadn’t spoken to in more than a decade reached out to her. Not just any man, mind you—her first love. The man who broke her heart. Daniel Burnett. Chief of Police Daniel Burnett. And he called all the way from Jess’s hometown of Birmingham, Alabama. He needed her. Lives were at stake. And Jess had nothing better to do. So she hopped in her ten-year-old car and headed south. The trip back to Birmingham restarted many things. The sparks between her and Dan that Jess had thought dead and gone long ago as well as an opportunity to re-launch her career as the deputy chief of a new unit in the Birmingham Police Department. Jess hadn’t lived in Birmingham in more than twenty years, so she was starting over from scratch. Her history there, however, goes deep and finding her footing won’t always be easy. POWER, book three in the Faces of Evil series, was just released and Jess is wading into her first official case as Deputy Chief Harris. The colleagues and new friends she made in OBSESSION and IMPULSE join her in this third installment and things are heating up between her and Dan. Jess is living in a motel room since there hasn’t been time to find an apartment. She isn’t worried about where she lays her head at night. Her single focus is finding the killer who left a woman dead on the cold, unforgiving marble floor in her own home. POWER leads us through Jess’s struggle to find her footing in BPD. She has to prove herself to those who feel she got the position because of her history with Dan. And somehow she and Dan have to find that sweet spot between the past and the present, between the personal and the professional. He can’t be her boss and her lover…can he? POWER leads us deep into the underbelly of crime in Birmingham while the developing relations between Jess and Dan and Jess and her team add a whole other layer of tension. I hope you’ll follow this cast of characters through all twelve books of the Faces of Evil series. Of the first two books, OBSESSION and IMPULSE, Cindy Gerard said, “Move over Jack Reacher, Jess Harris is comin’ to town!” And CJ Lyons said. “…readers won’t be able to resist.” RT Book Reviews magazine gave POWER, the third in the series, four and a half stars and said: Jess Harris doesn't have to go looking for trouble--it finds her. Jess is one of the toughest, smartest, most stubborn lady cops to strut the pages lately, but Webb's given her just enough vulnerability to keep her likable. 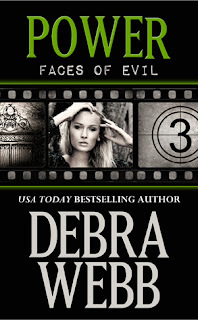 This third entry in the Faces of Evil series is a hard-to-put-down police procedural with pitch-perfect voice, well-developed characters and a setting that is as much a part of the cast as the protagonists. 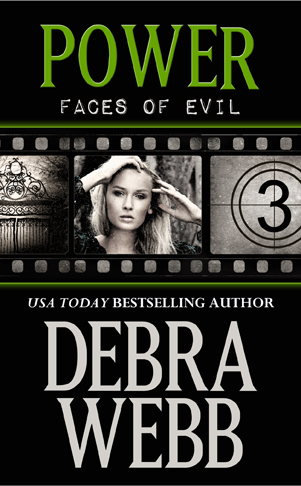 I’m giving digital copies of all three Faces of Evil books to one lucky commenter so don’t hold back! Tell me about your most unnerving “start over! And don’t forget to drop by www.thefacesofevil.com and become a person of interest! There’s going to be HUGE prizes in celebration of the release of POWER! Thought I'd drop by but already have all 3 bks, although it would have been funner to win them all!!! Anyone who hasn't read these books, do it NOW!!! Best mystery series I have read in a very long time and I read A LOT!!!!!! OMG! You made my year! Thank you so much! Be sure to sign up as a person of interest over at www.thefacesofevil.com! Kinda weird it shoes me as unknown on that post. Tried to edit to show my name and didn't work but hopefully this shows. Hm. Never had that happen before! LOL, Vicki! You made my year! Oh, Jessica, what a warrior woman you are! Cheers to you! And thank you so much! Laughing at the title of this post--Starting Over was the second book I wrote, and I gave it that title because I was, in fact, starting over because I'd finished my first manuscript and didn't know what to do next. Turned out the title worked for the book, although it's since been republished as Nowhere to Hide. But I know what you mean about changes. About 2 1/2 years ago, we sold our house in Florida and moved to Colorado. People would say, "where?" and we'd say, "Colorado" because that's about all we knew for sure. We showed up at our daughter's house after selling most of what we owned, and started looking for a place to live. We love it here, by the way. Hey Terry! Now that's starting over! Will I see you at Romcon next year? I'm going! How funny, I just joined as a Person of Interest a couple of days ago. I read your blogs on Murder She Writes and have your first in the new series in the TBR pile...which has tons of books, like all of us here-lol. My starting over was with a new job about 6 years ago. It was really hard to leave a job of 15 years where I new exactly how to do everything and was actually a peer auditor to move to a new one in which I knew nothing. It was great for the schedule and flexibility and I love everyone I work with, so it worked out very well! My e-mail is antonidis(at)aol(dot)com, just in case this comes out as unknown. Amy, thank you for joining as a person of interest! And thanks for sharing your story! I just wanted to stop by and add my two cents since I love this series. No need to enter me since I have all 3 books already. Congratulations on all your success with the series Debra. Judi, thank you so much! Be sure to become a person of interest on www.thefacesofevil.com! The 'biggest' starting over for me was moving 1500 miles to start a new life with my daughter. Neither one of us knew anyone or had a job, although we did have a place to live. There have been several starting over events since then, but that was the most unnerving. I've also just joined as a Person of Interest. I enjoy your books but haven't started this series ---- yet! Looking forward to reading them. Great, Karen! Thanks for sharing your story! Starting over... for me it was moving years ago. Moving to a new state, completely different climate, was not really built up yet. Cows and fields around... had to drive a bit of a distance to find a store or restaurant... through the years it has been built up abit.. too much in my opinion, but it took awhile and some adjustments to feel normal. Thanks for sharing, Colleen! Change can be overwhelming but we adjust, don't we? Hi Debra! You are a new author for me. The most recent starting over for me was when we found out my DH had Stage 4 Lymphoma Cancer back in February. He is ready for his 6th chemo treatment next week and seems to be doing pretty well. His doctor mentioned a possible bone marrow transplant down the road. We go to the VA Hospital almost every day for doctor appointments or IVs to keep his blood pressure up. Hugs and prayers to both of you! Hi Debra! Love your books! My big change: going from teaching middle school to teaching 4 year olds at a preschool! I spent the last 11 years teaching math and social studies, but recently resigned in order for my son to attend preschool. I was very nervous about not having job and being a full-time stay at home mom. But luckily a position opened up at my son's preschool and now he goes to work with me. Thank you! Congratulations on being a stay at home mom! That's an awesome and challenging career! These books sounds really good! The last time I started over was when our family moved to a new house about 5 years ago. While we moved cities, we didn't change jobs or church or anything. We met new friends and my children started school, so that was all a change but we didn't really start over too much. I have been blessed with not having to change a lot or start over much in my life. Even in my job of 13 years I have changed roles so while things have stayed fresh, they haven't been too hard. Thanks for the blog post. Well I just got "Power" for my KOBO from you today and it is fun to see what Jess is up to next. My 'starting over' is quite sad. My husband Dave died 5 months ago after a 40 year marriage & I have found that reading soothes me. I am so sorry to hear that, Janet. My husband and I just celebrated our 38th anniversary. Sounds like a good series. Probably when starting school every year. I going to have to read these books based on these comments alone. Can't wait. I started over with a company in 2004. I don't like change so this was a big step for me. My biggest start over occurred when I was laid off from a job I had had since I finished university. I was sure that it would be my career for the rest of my life, but that wasn't to be. I was a young wife and mom of a toddler, and my husband had been laid off the previous year. I decided that instead of blaming my luck, I would use my severance and go back to school to become a massage therapist. It was a struggle both personally and financially but I never regretted it for a second! On another note, I am very eager to read this series. Thanks for making this offer!